This Handmade unique Glass Lamp is specially made to enhance the Beauty and Grace of your Room. The beam of Light coming out from this Lamp gives Fantastic and Elegant look. It will surely add a unique touch to your home decor. This lamp is featured with a yellow light to brighten up your interior. Lit or unlit;the vibrant shades bring a lively pop of color to any space. Our Authentic Mosaic lamps create a warm ambiance of romantic intrigue. Use one lamp artfully displayed or collects a multitude for breathtaking impact. 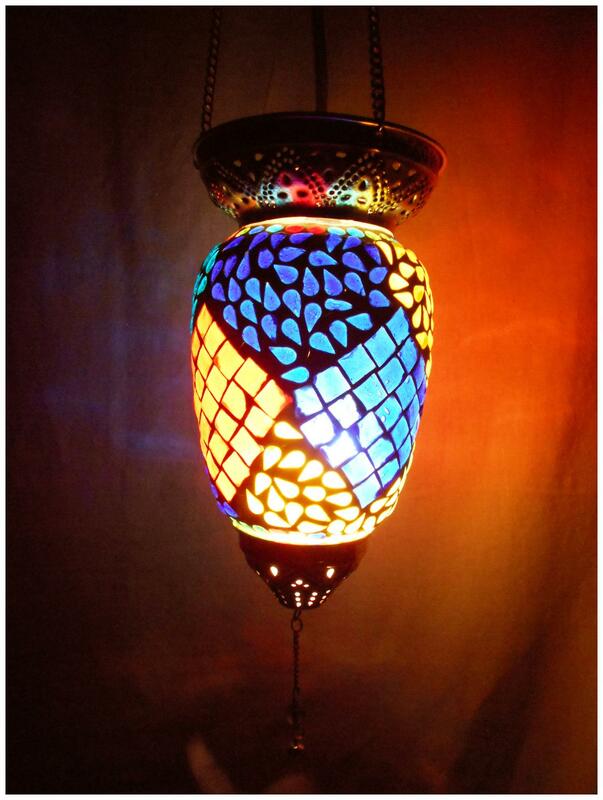 The lamps come in a variety of color and shape;and can be lit electrically or by candle votives. They can also be used as a hanging vase for fresh or dried flowers. The Enchanting Designer Lantern Is Crafted Out On A White Metal And Quality Glass. Light Up Your Home Decor With This Lovely Glass Lantern Which Can Also Be Used As A Showpiece. You can hang it anywhere you find best for this;you don't need a electric connection near there just put a BULB/CFL in it and plug that to switch. After lighten up it seems so beautiful. This lamp increases appeal to its surrounding when powered by artificial yellow or white light which makes it a must have to add cheer and color to your surroundings. When lighted with a bulb inside you will just end up saying Woww..!! !